Sen. Robert Menendez, D-N.J., is on trial in U.S. District Court in Newark, charged in a bribery scheme in which he allegedly accepted gifts from a Florida eye doctor in exchange for using his Senate office to benefit the doctor's financial and personal interests. The month-long trial resumed Monday and could last several more weeks. Soon, the senator and his legal team will have to make the same critical decision every criminal defendant must make at trial: whether to testify or remain silent. A defendant has the constitutional right not to testify or present any evidence. Neither the court nor the prosecutor may even comment on a defendant's decision to remain silent, and the jury is not supposed to take it into account during deliberations. In addition, a defendant like Menendez has the benefit of the presumption of innocence, giving the prosecution the highest burden of proof in the law: It must establish each element of a crime beyond a reasonable doubt. That's why a defense can present no evidence, snipe at the prosecutor's evidence and simply point at the prosecution's failure to meet this burden. On the other hand, these considerable constitutional and procedural protections can't neutralize human nature: Jurors naturally want to hear an accused person take the stand and deny the terrible things being said. So, will Menendez's team have him take the stand? One of his attorneys, Abbe Lowell, said recently that it's possible, but he gave no definitive answer. Joseph DiRuzzo, a criminal defense lawyer with experience handling federal bribery and fraud cases in the circuit where Menendez is being prosecuted, said: "Generally, if a case can be defended without having the defendant testify, then the defendant should not take the stand." There are exceptions, DiRuzzo said. "Sometimes the defendant is the only source of a defense theory because there are no corroborating witnesses." One example is self-defense. If no one saw the incident, the only way to establish that the force used by a defendant was in response to an immediate threat is usually through the defendant's own words. Menendez, who has denied all charges, is accused of using his office to influence business disputes worth tens of millions of dollars to the eye doctor, Salomon Melgen, and of supporting the visa applications of several of Melgen's girlfriends. In exchange, Menendez allegedly accepted flights on Melgen's private jet, first-class vacations in the Dominican Republic and Paris, and more than $750,000 in campaign contributions. Perhaps Menendez is the only person who can explain why those weren't corrupt transactions. But if he takes the stand and his explanation isn't credible, then he will look as if he's lying — and to a jury, that's worse than not testifying at all. The senator is a lawyer and a sophisticated public speaker, so perhaps he would hold his own on the stand. But testifying isn't a fair debate with the U.S. attorney. The rules are slanted against the witness. The witness must answer the questions as posed, and the prosecutor can ask leading questions — essentially making a damaging statement of fact and forcing the witness to answer yes or no. 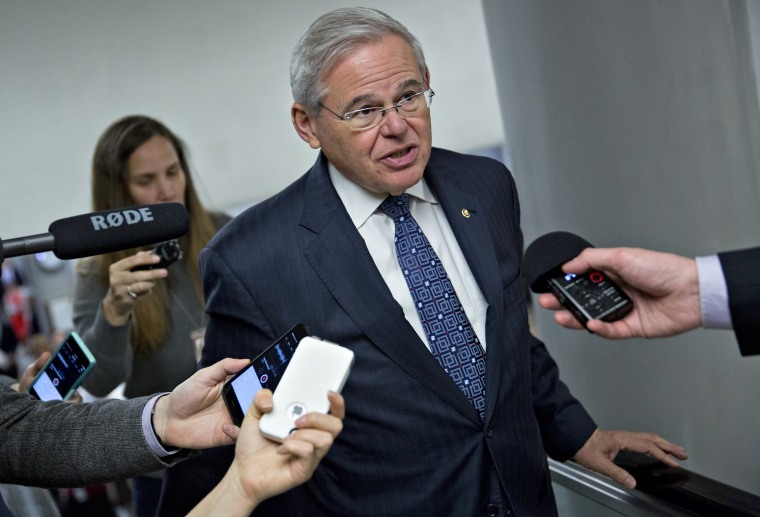 Unless Menendez's testimony is the only way to refute facts, he probably shouldn't testify. In bribery cases, so much other shady behavior is often involved that even the most brilliant witness can look guilty. Evidence of all the luxuries an official received from a wealthy citizen often sours the regular folks on a jury against the defendant. If Menendez chooses not to testify, the judge will instruct jurors that they can't consider, for any reason at all, the fact that he didn't speak in his own defense. They can't even discuss his silence during their deliberations. But jurors still want to hear from a defendant. All the instructions in the world sometimes don't change that.